Having seen FISTS OF LEGEND, the new martial arts film from South Korean hit director Kang Woo-Suk (Public Enemy, Moss), I’ve had it on the brain. My thoughts have now turned to imagining it as a gala musical production. It has the makings of: A lengthy running time of Bollywood epic proportions, atypical of the average martial arts competition story. An interweaving of long dramatic interludes that takes us through key moments in the main characters’ teen years up to their adult lives. All that’s needed is some catchy tunes and choreographed dance numbers. Fear not fight film fans, balking at the idea as being too camp. That’s all in my mental wanderings. FISTS OF LEGEND exists right now a mostly sober martial arts film. And, along with its numerous depictions of hand to hand combat, it absolutely stretches, pulls, and reshapes the traditional genre beyond the usual conventions. 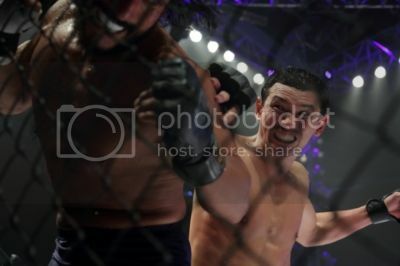 The story is built around the premise of a reality-based tv show bearing the same name, which invites average citizens preceded by reputations of great fighting prowess to prove their ability in MMA competition. Their incentives are the chance to achieve newfound glory and significant sums of money for each match won. Three of the contestants, all living unique but troubled lives independent of one another, happen to share a past connection, one steeped in violent strife that none of the three is eager to return to. The story shifts between the tragedy-lined past and the contestants’ current situations, with the Fists of Legends program beckoning them in. Front and center in the cast is Hwang Jung-Min playing Lim Deok-Yu, a one time Olympic boxing hopeful who now runs the family noodle shop while raising his adolescent daughter as a single parent. The opportunity to see HWANG in a major role is not one to pass up. My admiration of this star on the rise stems from seeing him play a weary, corrupt detective in The Unjust and a flashy but formidable expatriate gangster of Chinese decent in the recent New World. And that’s far from the whole of his acting accomplishments. Here he gets to show off a more nuanced performance range, capturing the good natured humbleness of someone content to be alive and accepting of his lot in life, yet haunted by his troubled past. Frustration and even rage are added to his emotional palate while trying to take care of his rebellious daughter and finding himself overwhelmed by her social problems at school. Another bit of interesting casting finds Lim’s teenage counterpart played by Park Jung-min, a young actor who delivered a riveting debut performance in indie film Bleak Night. That movie was a stunning exploration of the culture of violence surrounding adolescent teens. 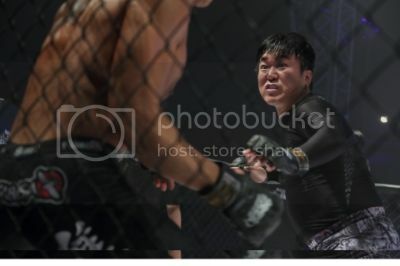 Park portrayed a victim of bullying; yet here he is the most dominant fighter of the area schools, modest at first, but soon showing signs of bravado and later, rage when his ambitions to fight nationally run afoul of corrupt powers that be. As an interesting tradeoff to the competitive matches that take place in qualifying rounds and, eventually, a tournament spectacle, we see a lot of violent interactions involving the characters in their high school days. Fights occur between rival school gangs and, eventually, between the main characters and local gangsters. At times these make for some of the more dynamic battle scenes, especially a nightclub brawl in which the high kick boys, fraught with frustration and recklessness, engage in a frenzied over the top battle with an army of thugs on their own turf that soon attracts police into the fray as well. The mixed martial arts sequences are no slouch either. In fact, it’s a feat to marvel at considering Hwang and his colleagues’ lack of prior training, all coming from backgrounds of playing dramatic roles. Matches are fast-paced with lots of striking blows. There are kicks that comes crashing down on opponents’ heads to look out for, and a wrestling style throw in the final fight shot from an incredible angle. Also worth noting is the fact that Lim and his peers have their own unique fighting styles portrayed consistently throughout the film. While the story is a sound one, a few aspects left me a bit cold. There is a certain pale vagueness about the venue where matches take place. It seems almost as though it could be part of an underground fighting circuit, or maybe the set of a low budget television production…the latter is in fact what I believe it’s supposed to be. The colorlessness about it makes some of the earlier fights seem a little too distant. The film’s unconventional inclusion of characters’ detailed backstories along with their current dealings, while a daring move, can also take away a bit from the total impact of its parts. It feels like a lot to keep track of at times. There are antagonists, inside and out of the ring, but they lack the intensity one comes to expect in a fight-centric story. At the same time, it marks an interesting shift from the typical, and perhaps dated goals of such films, which focus on the main character trying to best an archrival. Here, more socially conscious themes of salvaging damaged friendships and taking care of family take precedence. Yet, society is a prominent character in most of South Korea’s compelling films, and here as well, it serves as a worthy adversary to the protagonists. School bullying, the allure of organized crime on a disenchanted and misdirected generation, and corruption all contribute significantly to their struggles. The end goal, while not the bashing in of a hated rival, involves a different set of values, coming together of friends despite past differences, and strengthening of family bonds. Another curious aspect of Fists’ is its inclusion of various nods to American culture. From the sprinkling of one-word English phrases throughout the fictional program’s production, to the variation on ‘Eye of the Tiger’ that scores the big tournament. And there is the name of one of the commentators, ‘Jason,’ perhaps meant to reference him as a former competitor with a Korean American background. The show’s female producer and self-professed creator of the show promotes it aggressively and tries to wrangle the protagonists into the competition. 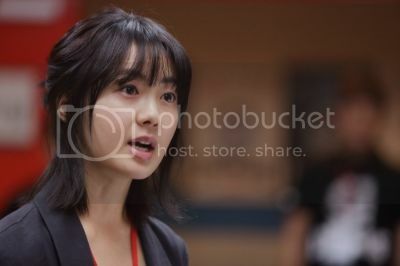 Her manner seems far from the traditional modest disposition expected of women in Korean society. I would be very curious to learn if her dialogue contains uncharacteristic qualities, and if this just happens to be, or if it is in fact a challenge to old fashioned cultural norms. Are these traits a sign of affection for Western culture? Or, in light of the prominent South Korean directors making recent English language film directing debuts, is it a call for more cultural exchanges and collaboration? Another hint of this comes by way of its release details: FISTS OF LEGEND opens this weekend in select US theaters, including here in New York and New Jersey, just a few days after its debut in its native South Korea.